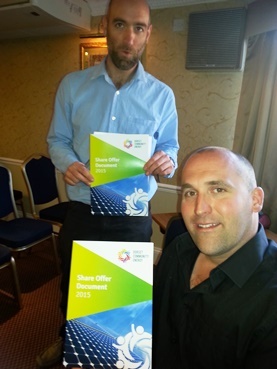 Dorset Community Energy launched the first community investment share offer in Dorset at the Wessex Royale Hotel, Dorchester on Friday 5th June. The offer will be open for 1 month between June 5th and July 4th, and provides local communities with the opportunity to collectively own high-tech PV solar panels. The development of the Dorset Community Energy solar panels scheme has been supported by the Big Lottery Communities Living Sustainably in Dorset programme. The aim of the share offer is to raise £135,000 to fund 6 solar panel installations on 3 schools and 3 village halls in the Dorchester and Bridport area. The 3 village halls (Martinstown, Osmington and Salway Ash) have recently been installed with solar panels using a short-term bridging loan, while the 3 proposed school installations are scheduled in August. It is hoped that all 6 installations will be fully operational by Autumn 2015. Local community members are invited to invest in shares, each at a value of £1. The minimum investment is £100 and the maximum £10,000. All shareholders will become members of the Community Benefit Society, which will oversee the 6 installations and ensure their long-term sustainability. 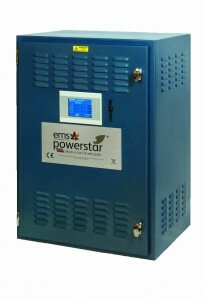 It was noted on Friday that membership makes both environmental and financial sense. The solar panels will produce low-carbon, free-of-charge electricity to each of the 6 buildings, with any surplus going to the national grid. It is estimated the energy created from these panels will displace the equivalent of 42 tonnes of carbon dioxide per year and provide approximately £200,000 of free electricity to the combined 6 sites over a period of 20 years. Dorset Community Energy has applied for Advanced Assurance for the Government’s ‘Seed Enterprise Investment Scheme’ (SEIS) tax relief, meaning that taxpaying members have potential to claim back 50% of their investment as tax relief. Upon considering interest and capital repayment, the internal rate of return (IRR) is projected to be 6.3% over a 20-year period, and 13.8% with SEIS. However prospective members should consider membership a long-term investment and are advised to read the Share Offer document available on the website www.dorsetcommunityenergy.org.uk in full and take independent financial advice before making an investment. "Hi, I hope you all get behind this offer to create real community energy projects in South and West Dorset. For those of you based in North Dorset and the Stur Valley we have our own community energy team ESVIPS.com come on lets get going and follow the lead of Dorset Community Energy. " In the article it states that speakers asked if “the noise from wind turbines 250m away was comparable with that from a busy main road outside a home.” Obviously the noise from a main road varies according to the time of day, the road surface and the speed of the traffic but generally speaking I believe on the basis of visiting several large wind farms that the answer to that question is that a road such as the A354 through Winterborne Whitechurch is far more of an issue than 4 wind turbines such as suggested for Blandford Hill. However the more important point is that the question might lead you to believe that the turbines are intended to be sited within 250m of the village. Having looked at the maps of the site the nearest of the turbines is about 1000m from the nearest edge of the village at which distance the turbines will be to all intents and purposes inaudible over the road and wind noise (wind turbines only produce noise when the wind blows and even then modern, well designed turbines do not waste valuable energy by making much noise at all). Dark mention is made of “health risks of noise and shadow flicker”. There is no reasonable evidence of health implications from noise or shadow flicker or any other aspect of the operation of wind turbines especially at the sort of separation distances involved. The noise is no threat whatsoever and whilst flicker can be an issue of annoyance more than health risk at closer distances, firstly you would have to be much closer to the turbines than any houses are proposed to be for it to be a genuine concern and secondly flicker only occurs when the sun is a) shining, b) at a very specific angle and c) at a specific time of day so it is perfectly possible to program turbines not to function during those few minutes each year if there is a property for which it actually is a problem. 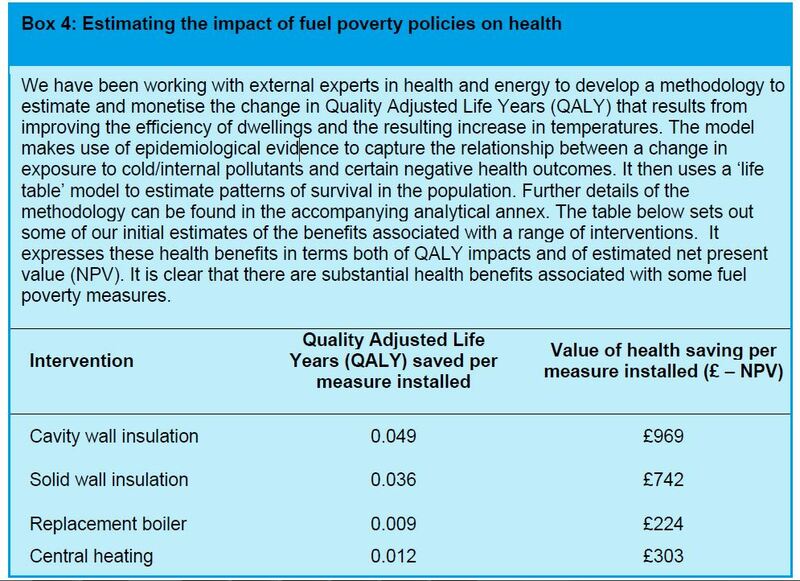 What is a health risk however is the very real issues of negative placebo effects generated by anti-wind turbine activists spreading false tales of dire threats to local residents’ health. An LSE draft report was cited which it was claimed said that wind turbines caused an 11% drop in house values for properties within 1.2 miles. This is no doubt based on the partial coverage given to the report by the Telegraph and the Daily Mail both of which fail to mention that the report suggests such a level of value reduction only if there are more than 20 turbines within 2km (1.2 miles) of the property under consideration. As wind turbines have to spaced out to work properly the only way of getting that many turbines within 1.2 miles of your house would be to have the nearest one practically in your back garden! Again it comes down to the fact that only 4 turbines are proposed for Blandford Hill and they are all about 1km or more from the village. There have been many studies of property prices and some show a small decrease in house values, some no effect whatsoever and some even suggest an increase in value. It is fact surprizing that there isn’t more of an effect given the false propaganda peddled at every opportunity by the anti-renewables lobby and the fact that there isn’t is largely due, in my opinion, to the fact that more and more people are seeing first hand that wind turbines are not the spawn of the Devil and don’t wreck communities wherever they appear. What there will be is some period of planning blight which will be made much worse by people going around falsely saying that the Winterbornes will be impossible to live in if turbines are built and dragging the whole process out for years to come. “Mr Turner described the offer (£30,000 community funding by REG per year) as essentially a “form of bribe”” says the article. This is true but it is not, as implied, a bribe to put up with horrible, non-existent, downsides of wind turbines but a bribe to make people ignore the scare stories of the opposition. It would be far better if wind turbines could be built more with genuine community investment and ownership giving even higher returns to local economies but as long as the hysterical anti-wind turbine lobby make it such a divisive issue it will only be the thick skinned big business enterprises that can see things through to giving us the renewable energy capacity we need for the coming century. coal occasionally suffer unexpected failures leaving far bigger holes in our electricity supply than any unexpected change in wind strength. Experience in Germany has shown that oft predicted problems in system balancing are proving less of a problem than expected due to the fact that the system is already set up to cope with variations in supply and demand and the fact that geographical dispersion and mutually balancing technologies like wind and solar make for a much more even renewables output than expected. We could increase our renewables penetration by a factor of about 3 before we reached the levels seen in Germany. Eventually we will need to invest in storage, demand side management and other techniques to modify our grid for the new century but we can build many more wind farms the size of Blandford Hill before this is a real issue. To conclude the sites at Blandford Hill and near to Tolpuddle (although it’s not nearly as near as the protesters make out)are good sites for wind turbines in the sorts of numbers proposed. They will make a significant contribution to the energy needs of our county and the local economy and most important of all will not ruin local lives. We have no choice but to get away from our reliance on fossil fuels for many reasons and wind turbines remain one of the best ways we have of doing so. Dorset Energized partners came together for an informative public exhibition and forum at the Corn Exchange in Dorchester. Members of the public took the opportunity to discuss renewable energy technologies with the installers present and also to quiz representatives from the proposed Winterbourne Stickland and Charminster wind farm proposals from REG Energy and Broadview respectively. Amongst the days activities there was an unexpected opportunity to lobby the UKIP prospective parliamentary candidate for West Dorset, see the latest in electric bikes and vehicles – both stationary and moving – as well as take part in some vigorous discussion around promoting renewables, the merits of the various technologies and issues of community investment and involvement. Dorset Energized is looking forward to organising another event in partnership with the Communities Living Sustainably Project at the Dorset County Show in September. For copies of the presentations given at the forum event please follow this link to the da21 website report – where they can be downloaded in pdf format. Britain’s favourite forecaster, weatherman Michael Fish, will give a dire warning to Dorset next month – years of even worse weather are on the way and we’re helpless to stop it. Mr Fish, who became a national icon through his forecasts on the BBC, is to spearhead a grim reality check on future weather for Dorset’s Climate Week [March 1st-6th]. Pulling no punches, Mr Fish is to deliver a lecture at the Dorchester Corn Exchange on Monday March 3rd entitled ‘Climate Change – The Ultimate Weapon Of Mass Destruction’. The weather expert who spent 42 years with the Meteorological Office is bound to shake up climate change doubters with his informed view. ‘There could be much more severe weather and floods in the UK. It is too late to do more than slow it,’ Mr Fish warned bluntly this week. 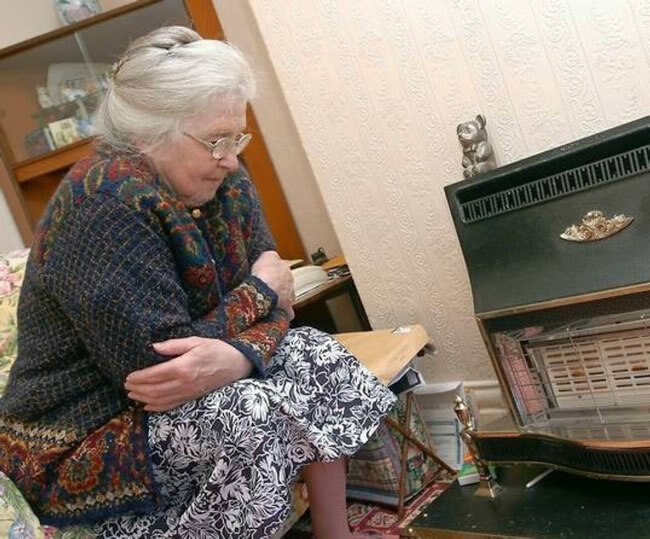 Although authorities are only recently waking up to the problems of climate change, Mr Fish said the weather has been known to be worsening for more than 40 years. ‘The basics were identified in the 1880s, the severity in the 1970s,’ he said. And he gave no hope of things getting better for the storm-bashed West Country, forecasting a bleak future of sodden winters and scorched summers. 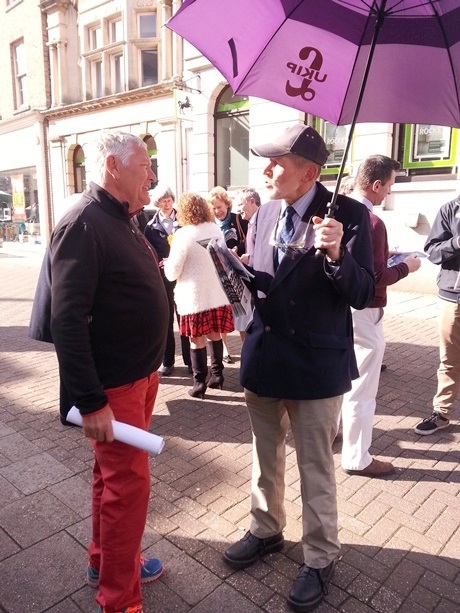 Supporting Mr Fish’s forecast that the effects of climate change may be slowed, Dorset’s Communities Living Sustainably in Dorset group, funded by the Big Lottery Fund, has organised a week of events aimed at inspiring a new wave of local initiatives against the weather threat. On Saturday March 1st the programme will kick off at Litton and Thorner’s Community Hall, Litton Cheney, with a planning conference on strengthening local food links in West Dorset. Speakers including Tom Andrews of the new national Sustainable Food Cities Programme and Traci Lewis from Foods Plymouth will share their experiences and advice for putting food at the heart of the local policy agenda. On March 3rd in Dorchester, Mr Fish will be joined by writer and poet Matt Harvey, who will present his view on sustainable energy. On March 5th Bridport pupils will meet with the CLS to discuss ideas for preparing for extreme weather and tackling climate change. On the same day in schools in and around Dorchester the CLS will celebrate their work on litter meet with pupils and launch a two-year initiative to lessen environmental impact and encourage environmental leadership in students. On Thursday March 6th the Bridport Arts Centre will host a Focus On Energy film day, which will include movies on the evidence of climate change, energy efficiency in the home and a documentary with contributions from more than 50 politicians, scientists and environmental campaigners on the state of the planet and how to save it. West Coast Energy are holding a public exhibition where an updated proposal for a five turbine wind farm on land near Tolpuddle, north east of Dorchester, will be presented. 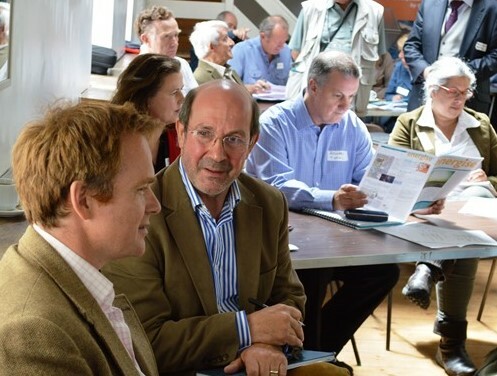 The exhibition for the West Dorset Wind Farm proposal is being held to give the local community an insight into the updated proposed development. This is a public event open for attendance by anyone. At the public exhibition you will have the opportunity to comment on the proposal, ask questions and put forward your views to the West Coast Energy project team. Dorset Community Action are holding a series of Fuel Poverty Workshops in January. 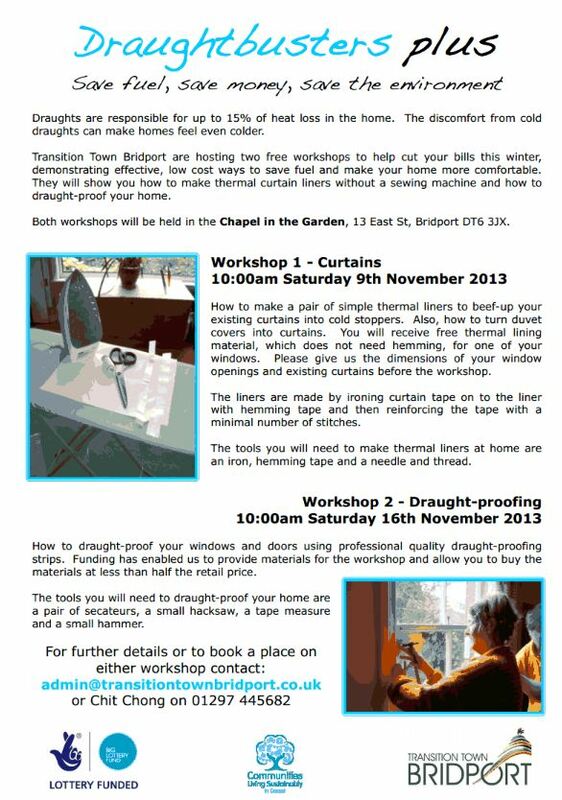 The workshops will be held in Lyme Regis on the 14th and the 29th in Sherborne. 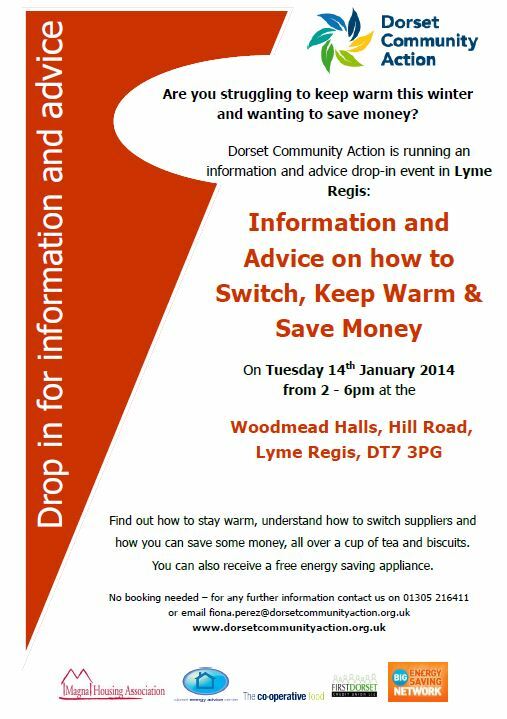 The workshops are being supported by Dorset Energy Advice Centre and Magna Housing Association amongst others. There is a shift in thinking regarding car use. A growing number of people are no longer aspiring to own a car due to rising costs and environmental issues, such as climate change and congestion. These people are turning to other forms of transport which are cheaper and kinder to the environment, often using multiple modes of transport to replace the car. Other people are selling their second car, which sits on the driveway most of the time, costing its owner’s a small fortune in depreciation. 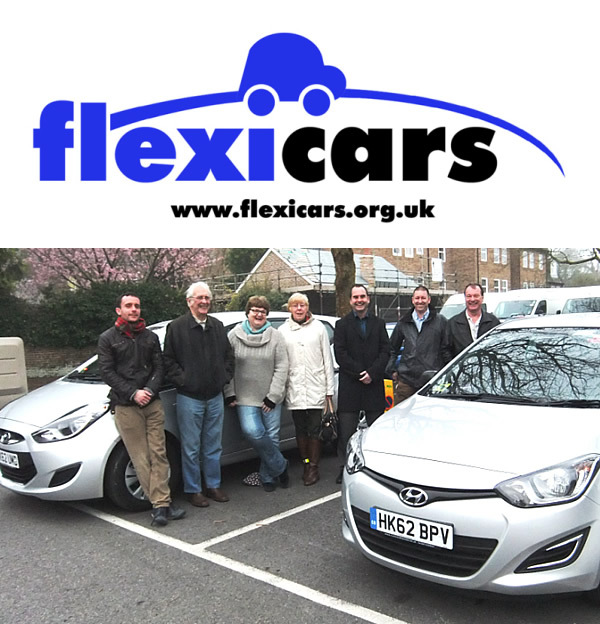 Dorset Flexicars offers its members access to nearly new, fully insured and well maintained vehicles to hire by the hour. This allows members to use other forms of transport like walking, cycling and public transport, and then on the occasions when they really need to use a car, they have one available to them. The club also has a number of business users who use the vehicles. Dorset Flexicars C.I.C. is a Community Interest Company which exists for the benefit of the community and is “not for profit”, which guarantees members great value for money. The club is now expanding into Weymouth and Blandford Forum after securing grant funding. This has paid for four new cars, which will offer the people of these Towns the opportunity to try out this scheme. If you want to know more, or wish to become a member; visit www.dorsetflexicars.org.uk, email info@dorsetflexicars.org.uk or call 08456 211 611. Dorset Energy Advice Centre (DEAC) and North Dorset District Council (NDDC) are working together to deliver a FREE half day session on Fuel Poverty next Monday 4th March 2013, 9:30am – 12:30pm in their Council Chamber at NDDC, Nordon, Salisbury Road, Blandford Forum, DT11 7LL . With the advent of the Green Deal and rising energy prices not likely to get cheaper, this training will give attendees an excellent introduction to the definition of the term, the causes, and what can be done to mitigate it. The training is opened to all individuals who volunteer or work for organisations and community groups who have an interest in this field. To make a booking or for more details about the training, please contact Becky at DEAC on 01202 209417 or email Becky@deac.co.uk. 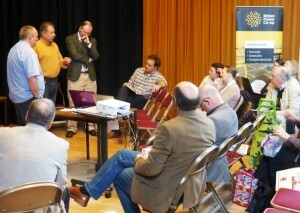 Last weekend was spent gaining a direct insight into the rather polarizing and fractious debate around Wind Turbines in Swanage and Tolpuddle [at the WindFarm Meeting on Saturday 12th January 2013 at the Tolpuddle Village Hall]. It started with a question and answer session at a well attended meeting headed by the ever articulate and lucid Oliver Letwin in Tolpuddle Village Hall on Saturday; followed by a rather bracing Sunday morning on Swanage sea front. Although both events had their energies originating from the ‘anti’ side of the spectrum, both had their supporters, with Swanage in particular seeing a well organised ‘pro’ counter demonstration, challenging the challengers by their own event title. The Tolpuddle event, organised in part by Tolpuddle Against INdustrial Turbines (TAINT) was not as hostile as one might have assumed, thanks in part to Oliver Letwins ability to hold the views of the agitated protesters in his well organised tones. Perhaps it was also due to the rather early start (9.30am) although the hall was completely packed. He did come down on the side of opposition to the application, on the principle of scale, which some might think to be a rather clever ploy as he did highlight his general support for Wind Power as part of a future energy mix, including Nuclear of which he is a supporter. My interpretation was that he left room for the proposals to be scaled down to be more acceptable to the Dorset Landscape, a view which I am a little sympathetic view since seeing a presentation by land rights campaigner Alistair McIntosh (no relation) who asked some difficult questions of the environment movement as to the impact of very large turbines on the Scottish landscape. The meeting benefited, although the majority of attendees might disagree, with the presence of Ampair chief executive David Sharman. Ampair, based in Milborne St Andrew of all places, is the UKs oldest Wind Turbine manufacturer. 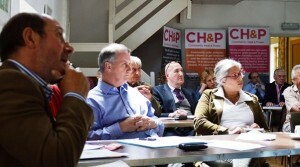 David also has a local connection and no ‘declaration of interest’ apart from a rather tenuous one suggested by a member of the audience that he would benefit from the overall market benefit to his product. An interesting exchange was had between Mr Sharman and Letwin, in particular Letwin being asked to declare his overall support for Wind as part of the mix, as detailed in the recent 2020 Conservative report which is suggesting future policy approaches to a Conservative Government post 2015. Also more importantly he pulled out Letwins personal view that their should be a form of national guidance as to what are the most suitable, or rather what are the most unsuitable, sites for Wind Turbines in the UK. He stated at the moment this was his personal view, but in a few months time this might become a Cabinet view. This raises a potentially interesting dichotomy which Mr Sharman pressed him about, a central planning type approach would go against the the broad thrust of a market driven planning system and the policy of localism, mainstays of current Coalition policy. Letwin seemed convinced that the current planning system rules, at any rate, would be able to reject the application on valid grounds. I suspect he has had discussions with the local authority, as he delivered this statement with some weight. Letwin also reiterated his faith that the increasing flexibility of the Grid to respond to intermittent sources of energy such as Wind (typically called the Smart Grid) including using electric cars as ‘storage batteries’ would mitigate concerns over efficiencies of renewables. Although some might disagree with his politics Letwin does read around enough to formulate his own views and reasoned arguments. I asked a question concerning community ownership and perhaps the community could take up the responsibility for generating as much energy as they can locally, which Letwin deftly took up using the example of community owned shops. Their was no mutterings that I could hear against this type of proposal, but neither was their rampant enthusiasm. I was left thinking that if only this kind of enthusiasm, energy and action could be harnessed to work on solutions, rather than simply a blanket ‘No’, then we might have a better future. The demonstration in Swanage was a more heartening affair for me, with the reassuring prescence of well prepared counter-protesters from the local Greenpeace and Transition Town groups and other enthusiastic activists. I think it as fair to say that the originators of the ‘anti’ protest were somewhat bemused to have such a vocal repost, myself and a friend had several interesting and reasoned conversations with our opposite numbers and there was some press coverage although with the authority of being the originators of the event, the ‘anti’ group tended to get the top paragraph quotes and headline, although the Guardian of course was a bit more sympathetic. The overall musing from both events was again somewhat astonishment at the sheer voracity of some of the opposition, and how it links to, imperceptibly at times, frustrations over power and ownership of land (Crown Estate and private landowners), subsidisation arguments (despite greater subsidies elsewhere in the energy market) and despite the obvious effects of the industrialised agricultural system over the last 100 years, aesthetic concerns over the landscape. You cannot help thinking that their is a psychological component buried deep underneath all this. Which indeed puzzles me still further, as those who have gained the most in the relatively cheap fossil fuel energy, post war economy, tend to be of the generation who make up the bulk of the ‘anti’ protesters…. surely a few dots on the horizon is a small price to pay so that those since born have the same? "I have just read some of the comments on the website and I am sorry that we just don’t appear to be making any headway with education about wind turbines. Please Mary worry not your relatives with autistic children will not hear the turbines from nearly a kilometre away, indeed the children may even love the sight of the new Windmills. Not so long ago almost every major Town in England had windmills really close to their centres, why… because that was were they milled the corn. It was food from wind and now its energy from wind. Dear Mr Carmichael none of your points are valid. The CO2 emmisions are zero and the payback of carbon in production takes an average of 18/24 months. 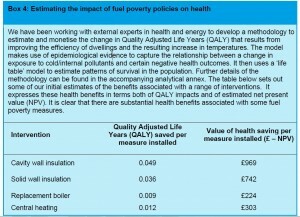 Compare that with Power Stations and oh by the way how many years and where will Nuclear Fuel go. The old chestnut about not creating on-going good energy is nonsense… why do you think the World is investing in them when you say its so inefficient, maybe you have to ask yourself some questions before making statements to rubbish this wonderful new clean free energy!!! Yours in the hope we can slowly but surely change your thinking by giving proper, true responses to your comments. Finally Bill I have some sympathy with your comments. Good people and true have been fed fairy tales that they believe to be true, now is the time to help to breakdown these ridiculous barriers and realise that we are all in the same boat. " 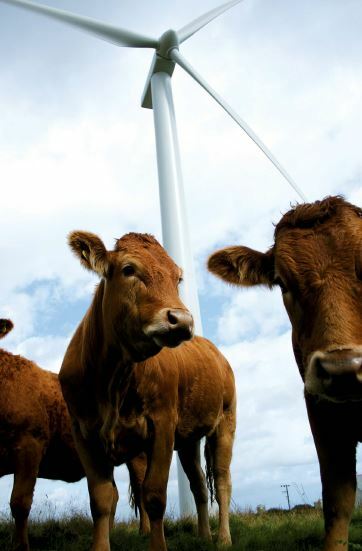 "We must take everyone’s views into consideration but I do get a bit disappointed to hear the same old arguments over and over on every post about windpower, as they do sometimes seem perhaps a little narrow minded and selfish. I do agree with B M Carmichael though that windpower is just one option and there are no goodies or baddies here, but I would love to see the same people who hate wind turbines show their passion in a more positive way (or at least readdress the balance of their protest) to engage with and promote all the other more accessible forms of renewable energy that are less emotive, and of course took more steps to save energy in the first place : ) "
"the tragedy is this, it is easy to decide that people who are anti windfarms are anti renewable energy, may be it gives comfort to those who accept wind power blindly as the solution, you will find if you really bothered to, that in fact most people who are anti windfarms are pro renewable energy, they are just against windfarms and other inefficient and damaging renewables. windfarms currently globally cause CO2 to be produced, because they make the power station cycle in power, because wind energy is so intermittent and unreliable. There are many reasons why people do not favour windfarms, there is so much information out there to find out why, but dont be lazy, and self satisfied, dont just think that people who are anti windfarms are out of the ark, they may well be better informed than you, and that is why they have chosen to feel as they do about windfarms. Sorry if this offends. Just think, and question why? It is not as simple as you would like it to be, have a real challenge try and find out why! " "your small dots on the horizon are less than 900 metres from my relatives home, they have children who are severely autistic who are hyper sensitve to sound, one of whom also suffers from epilepsy. Do you wonder why they might be amongst those desperately unhappy at the thought of having the wind farm so near to them. A child who is severely autistic and has severely challenging behaviour as well has enough to cope with, the World is a baffling place for them, and sometimes a very cruel one. " "Ampair chap did not indear himself when he said that the anti windies were all incomers, that rather disgraced anything he further said! Not a clever move! Perhaps it would make more sense in the first place if windfarms were put in places that were the least sensitive and less likely to cause protest, build them away from peoples homes, away from coastal areas that depend on tourism to make their bread and butter, remember Dorsets average wage is less than the national average to start off with we can’t afford to shoot ourselves in the foot can we! To have a strategic Government plan that works out the best places where to put the windfarms in the first place would probably have saved alot of grief and upset. I think you are not on the right track about the psyche regarding the antis though, I know of people who have probably been greenpeace members than some of us have been alive, who have probably been pro renewables likewise, and they are immensely worried by the windfarms impacting on humans, because it lessens the popularity of wind farms in the first place, making people anti. It would be sensible to try and make people happy in the first place would nt it! " "Paul what a great report. What really strikes me is that if the protestors could only take your attitude and talk things out, come to a consensus, the World be be such a better place. Thanks for your blog, I am looking forward to the next round and will try to be there. My last walk was as a student marching from Aldermaston to London – people can still make a difference. " Dorset residents and communities are invited to a meeting to set up a local coalition of groups and individuals opposed to hydraulic fracturing (“fracking”) on Tuesday 15th January at the United Church in Dorchester (entrance in the shadows of the infamous new council offices). Please let me know if you will be coming so that I can keep an eye on numbers in case we need a larger room. You contact me via da21 at paul@da21.org.uk. Image above from http://dangersoffracking.com designed by Linda Dong. 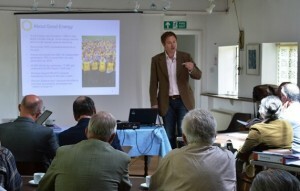 A new Community Energy Group Newsletter has been released for December 2012, supported by RegenSW, as the first community energy bulletin for the South West region. The newsletter aims to provide you with updates from the Community Energy Group Network and information about their Communities for Renewables Support Programme. It includes information about plans, progress so far, policy changes, upcoming events and useful case studies from across the network. Tip of the Pops Award Winning Eco-Disco! 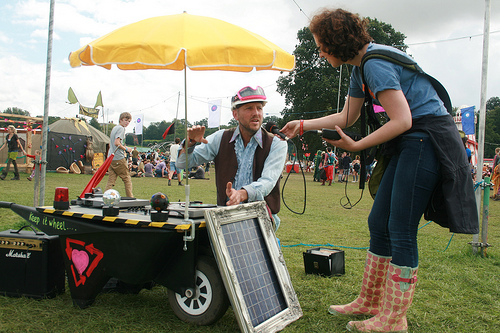 Tip of the Pops is an award winning eco-disco made by combining recycling and renewable energy. 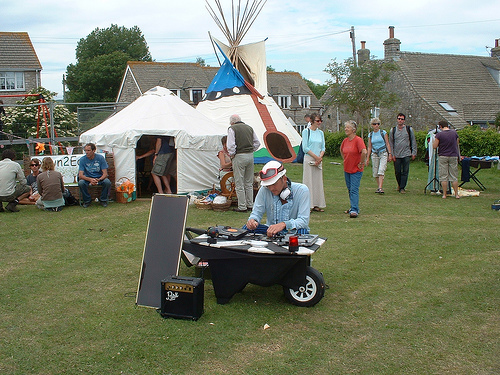 Their unique brand of environmental activism with mass boogie appeal has been ‘Keeping it wheel…’ since 2007. Tip of the Pops is actually DJ Dynamo and Earwig his solar powered wheelbarrow disco. All of the equipment and music is reclaimed waste from local recycling centres. The basic system is ‘wheely’ mobile and can be used anywhere, there is also a larger mobile disco using the same ‘Ecotainment’ philosophy. DJ Dynamo has the freedom to set up anywhere, no power required. He can provide family entertainment, late night parties, educational activities, join in with parades or pop-up in obscure places. There are also several fun demonstrations such as a pedal powered beat-box and recycled solar ovens that can be used at your school or event. This year we have performed a world exclusive at Shambala festival, business lunches in Blandford, Salisbury schools, community fairs, weddings, children’s birthday parties and much more. Previous clients include the Dorset Wildlife Trust, Environment Agency and Lush. If you would like to book Tip of the Pops or find out more please visit the website www.creativedynamo.net or contact DJ Dynamo on 07789865934. 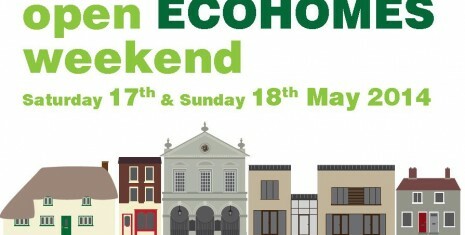 "Love the eco disco would you be happy to come to any of our events for renewable energy ? " "Hi Lee, Vince and Paul. Hey…thats our Down2Earth PEAT yurt ! Would you be up for coming along to a school event. :o) Hope you are doing ok.